The pitch needs to be on level ground and free from obstructions and overhanging branches. Like the photo above, a permanent pitch will benefit from a path from hockey to iron to reduce wear on a grass area. Some pitches are laid out on concrete or paving – needless to say these need to be away from thoroughfares (ideally) and preferably without a car park behind or adjacent to the shed! 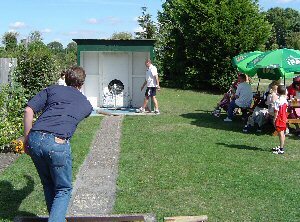 The Aunt Sally pitch at The Fox, Steventon. The shed at the iron needs to be well constructed/weatherproof and should be padded to reduce the energy of the sticks and hence their likelihood of rebounding. If not a shed then padding needs to be provided. Lighting is needed at both ends for late evening play and safety. Some pitches are of necessity a compromise and this adds to the atmosphere, skill and in some cases the patience needed for the game. Print this page, download as a PDF file, or send via email!